of North Ayrshire. The parish includes the sizeable town of the same name, Fergushill and the Eglinton Country Park. Kilwinning town, which lies on the River Garnock a few miles inland from Ardrossan by way of busy Stevenston, is notable as the home of Freemasonry in Scotland. Mother Lodge Kilwinning (No 0) was founded in 1107, at the same time as the Abbey, of which the few remains have been incorporated into the present Parish Church. 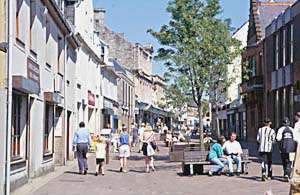 Kilwinning was known earlier this century (20th) for its engineering works, iron foundry and fire-clay works and with an older worsted-spinning industry. With the advent of the railways, Kilwinning became known as 'The Crossroads of Ayrshire'. The town has grown considerably into the suburban sprawl linking Irvine in the south and Stevenston and Ardrossan to the north west. 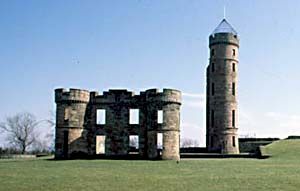 Eglinton Castle (the seat of the Earl of Eglinton) is chiefly remembered as the scene of the great tournament in 1839 by which it was hoped to revive certain aspects of ancient chivalry. The old Home Farm has been transformed into the Eglinton Country Park which is open to visitors. Between Kilwinning and the sea is a somewhat desolate area of sandhills in which were once large explosive works owned by ICI. Through this area the River Garnock winds to the sea and the Irvine, after making an extraordinary loop, joins it, just below the town of Irvine. The area includes the Bogside Golf Course.